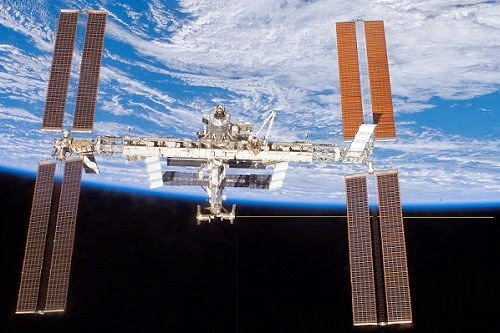 International Space Station could use a laser to shoot down space junk. Credit: NASA (laser added by Brevard Times). CAPE CANAVERAL, Florida -- Scientists have come up with a solution to get rid of space junk in low Earth orbit by detecting it with a telescope and then shooting the debris with a laser mounted on the International Space Station (ISS). But don't look forward to any laser-induced explosions is space. After locating a piece of floating space junk with a super-wide field-of-view telescope, scientists propose shooting the debris with a laser pulse to slow down its orbit; thereby causing the space junk to fall back into Earth's atmosphere. Space junk is made up of artificial objects orbiting the Earth as a result of human activities. The number of objects have nearly doubled from 2000 to 2014 and pose a hazard to present and future space activities. Recent estimates place the total mass of space junk to be about 3,000 tons. Because the debris exists in different orbits, it is difficult to find and capture. Scientists say that these two instruments would be capable of tracking down and de-orbiting the most dangerous space debris, around the size of one centimeter. The intense laser beam focused on the debris will produce high-velocity plasma ablation, and the reaction force will reduce its orbital velocity, leading to its reentry into the earth's atmosphere. The scientific team's research and proposal was published in the most recent edition of Acta Astronautica.